I'm so caught up in mapping that it affects everything I do — it's a major force in my life. It's an addiction, an obsession. It also gives me great joy and lends a purpose to my days other than merely wondering how much time I have left on this planet. Unfortunately, at my age one's thoughts tend to turn in that direction all too often. Mapping focuses my thoughts in a much more positive way. I'm learning about something that has fascinated me forever, the visual representation of geographical features on paper or a computer screen. The desire to talk about mapping has now brought me full circle, so to speak, and motivated me to write a long overdue blog post. I'd rather not divulge, or perhaps confess is a better word, the exact number of hours I spend at the computer on Open Street Map (OSM) projects but most days it's like a fulltime job. I'll sit down at my desk first thing in the morning, usually at about 6 am, with a cup of coffee beside me to check my email and before I know it I'll be adding some details to OSM or planning a moto ride to check out an area I'm curious about but haven't seen in person. I used to write in this blog more often but I just don't seem to have the time anymore. Ridiculous, I know. Those of you still working know how precious personal time is and you might think a retiree has nothing but time on his hands. But between tennis, a relationship, motorcycling and mapping I manage to keep myself quite busy all day, every day. A short while ago I got an email from an OSM mapper in Belgium. He asked if he could interview me for a "Mapper in the Spotlight" series started by the OSM Community in Belgium a couple of years ago, the idea being to get to know one another so as to become more of a community. He only knows me from some posts I made on OSM's Tagging listserv, which is a mailing list where participants discuss how to tag (or otherwise characterise) mapped objects for the OSM database. I felt honored and responded right away. Marc sent a list of questions that I answered and which he incorporated into his blog. Answering his questions in my own words constituted the "interview" and I suppose that's the best sort of interview one could hope for, i.e., one you write by yourself about yourself. If you want to read it you can find it here. The tree mapping project I touched on in that interview is what I'm working on lately. Nut and I moved to Nong Hoi last spring. Our new neighborhood is on the south side of Chiang Mai and after discovering the good coffee shops and restaurants nearby, we've come to really like it. 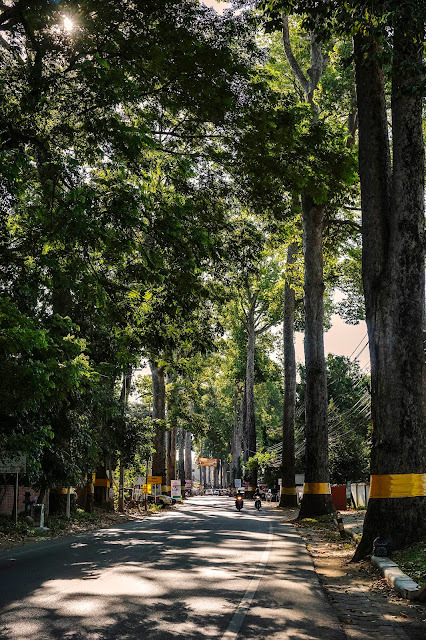 I have been fascinated by the magnificent and stately Yang na trees lining the Chiang Mai-Lamphun Highway through Nong Hoi (Route 106) since I first saw them several years ago. Their scientific name is Dipterocarpus alatus and they're related to rubber trees. Thais call them "ton yang na" (ton = tree). These splendid trees have an interesting history. They were planted in 1882 by order of King Rama V when the Chiang Mai-Lamphun road was but an ox cart. Residents living along the track were delegated to care for them by supplying water and fertilizer. You can read more about how they came to be in this short article. The shade they provide on the now very busy thoroughfare is wonderfully cool and reminds me of the elm tree "tunnels" that once adorned most of the streets in my hometown of Buffalo, NY. Buffalo's elm trees are long gone, killed by the Dutch Elm Disease that ravaged the U.S. back in the 70s. These trees might disappear someday as well but for a different reason: traffic and pavement have stifled their growth and made them vulnerable to disease. Dipterocarpus alatus is now considered an endangered species in its original habitat (see this Wikipedia article), and many of the Nong Hoi trees are either gone or in poor health. 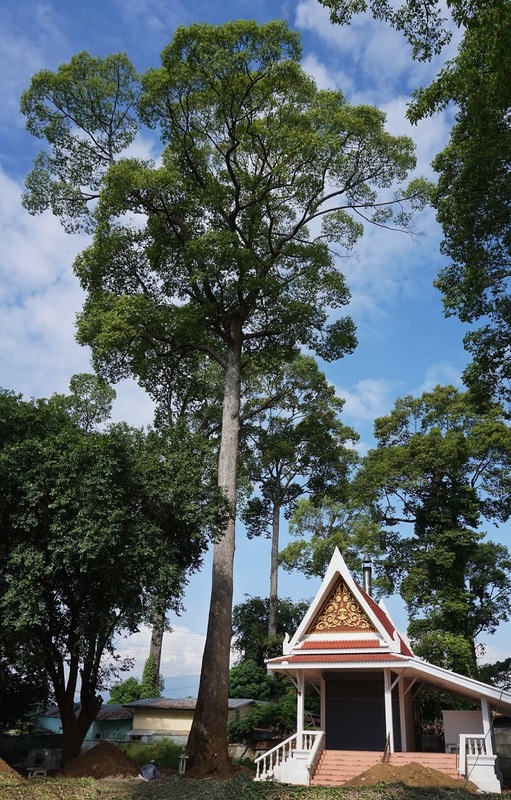 You can tell by the ribbons of gold cloth tied around each trunk that the Thai people revere them. Yet despite that concern pavement continues to encroach and their overall health continues to decline. 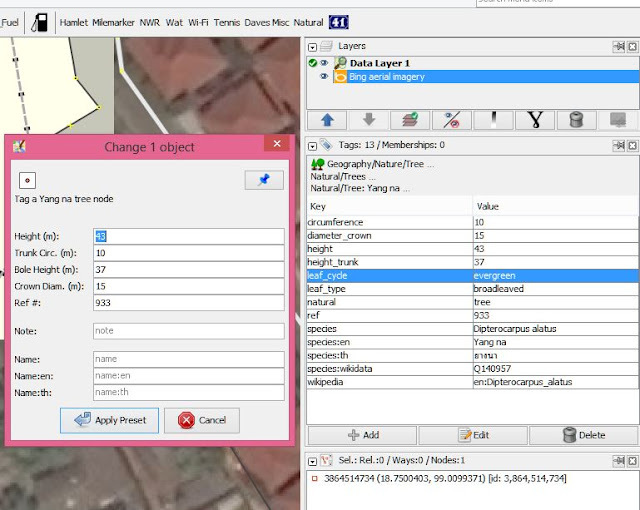 I'm planning to enter data for each local Yang na tree into OSM. 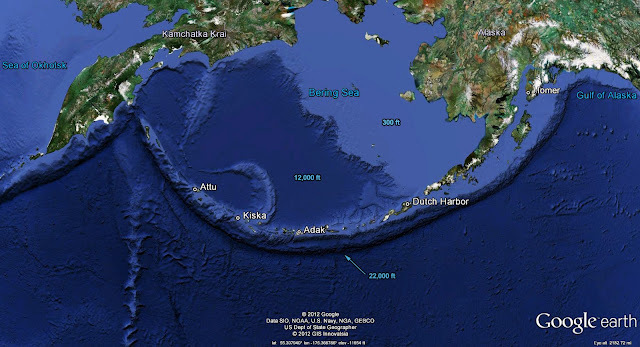 I will locate them positionally by using a combination of GPS data and spatial observations from the ground. Almost every tree has a tag with a number on it. I'm not sure which Thai government agency maintains these records, or if any do, but I'll enter that number in the ref tag when available. 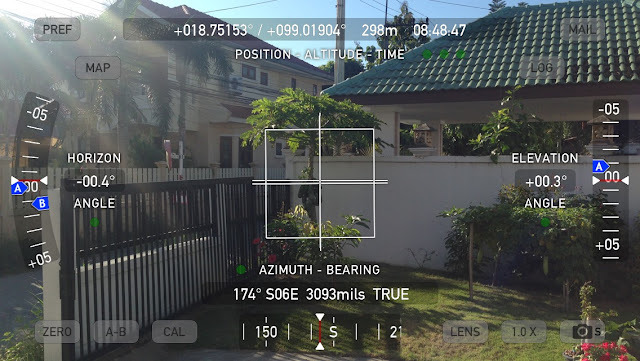 I measured the height of some of the ones closest to my home using an iPhone app called Theodolite which does the same thing as the theodolite instrument used by surveyors, which is to measure angles. It's not nearly as accurate as those precision instruments but is, as we say, "close enough for guv'mnt work" and just the ticket for my needs. In practice you can use simple trigonometry to calculate the height of the side of a right triangle given the length of one side and the angle between them. The trick is in measuring the angle. Theodolite makes that easy. I paced off a distance from the base of a tree and then sighted back toward it using the crosshair to mark A and B readings at its base and top; Theodolite then calculates a height. Since all these trees were planted at the same time most are roughly the same height, which is about 40-45 meters (~150 feet). It's not my goal to measure the height of each and every one of perhaps a hundred trees still standing but over the next few months maybe I'll get most of them positioned. Using a preset makes it easy to remember exactly which tags are necessary to fully characterize the trees; it includes the scientific or Latin name, common names in both Thai and English along with the physical measurement data and saves me having to enter each tag manually. I've included tags with links to a Wikipedia article and the Wikidata entry. The code above produces the dialog box at the left (see below). After filling in the physical data and clicking Apply Preset, JOSM's Tags/Memberships Window (on the right) shows the relevant tags which are now ready to be saved and uploaded. That's why I began creating my own map icons that will display on my Garmin GPS and in Garmin's Basecamp program. For me, seeing the POIs I've entered on a map is one major payoff for the work I've done entering the data in the first place. I can also customise the colors and appearance of highways, woods and landuse polygons, and decide which POIs I want to see. I might not be interested in seeing hairdressing shops or veterinary offices visually but I definitely want to know if there is a nearby shop selling motorcycle fuel by the liter if I run low while riding out in the boonies. These small "bike petrol" shops are very common in rural Thailand where motorcycle travel is the norm. In fact, distinguishing a small shop selling fuel hand-pumped out of a large drum from normal full-service fuel stations was one of my main motivations for making my own maps and customizing them for my needs. To the OSM community both are "amenities", places to buy motor fuel. But personally I would not want to drive to a place that's hand pumping fuel by the liter if I need a tank of fuel for an SUV. I designed a unique icon for my GPS that enables me to tell at a glance which type of fuel station it is. Another type of fuel station that's become increasingly common in rural Thailand are vending machines that accept paper currency in exchange for a metered quantity of fuel. I'm betting these shops will eventually replace the drummed fuel shops. I made an icon for those too, one of which is visible at upper right in the above Garmin Basecamp screenshot. Getting back to trees, I've designed some icons to represent them as well. They need tweaking but they'll do for now. My plan is to use several different sized icons to represent trees that are especially broad or tall. Tests can be made during the map compilation process to determine sizes just as species is determined now. 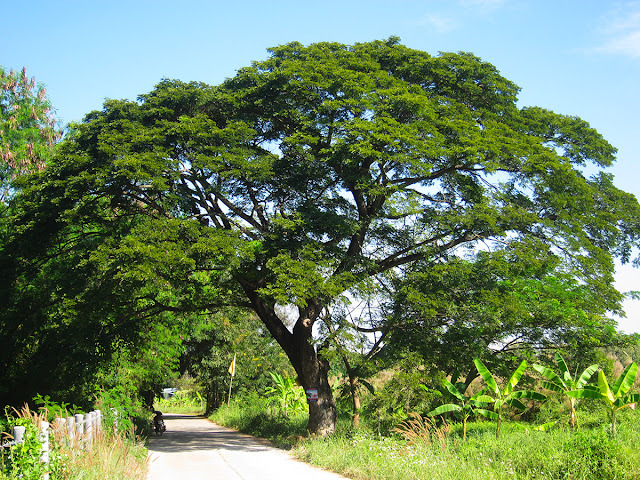 Another favorite tree, common here and appreciated because of the shade its huge leafy crown offers, is the Rain tree. Its scientific name is Albizia saman. Thais call it Ton Chamcha (ฉำฉา). This tree has a shape something like an umbrella and they are literally everywhere. I have a preset similar to the one for Yang na that applies a set of tags specific to this tree. I also have presets for teak (Thai: ton sak) and Bodhi or Buddha trees (Thai: ton pho), both are fairly common and both have special significance in SE Asia. 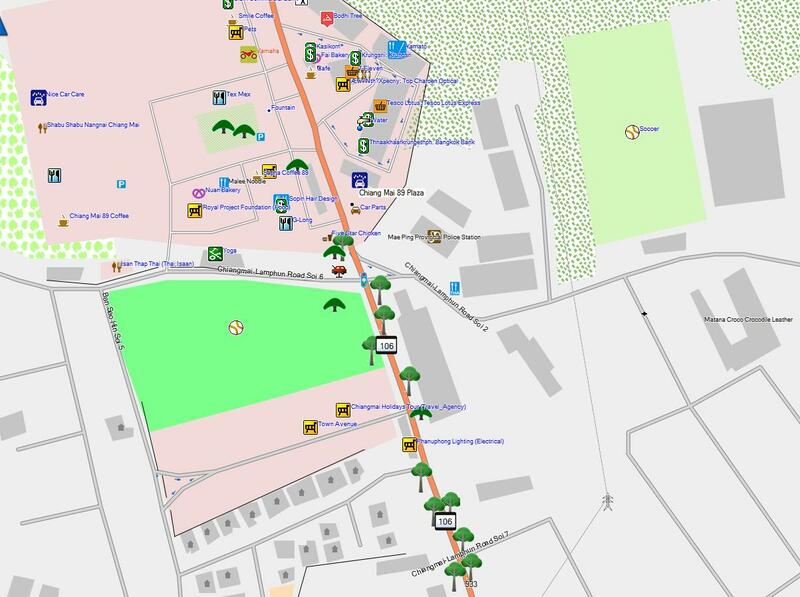 Below is a screenshot of an area in my neighborhood where Yang na trees line the Chiang Mai-Lamphun Road. This image is also taken from the Garmin Basecamp program and displays almost identically on the screen of my Garmin Montana GPS receiver mounted on my motorcycle handlebar. I add this last photo just to show that not all trees in my neighborhood are big or magnificent. Here is a shot of the little papaya tree that was only a stick when we moved here last March. In just 9 months it gained substantial height and its trunk is about 5" in diameter. As you can see it also has fruit almost ready for harvest. Nut's excited because she loves papaya and to get them for free is extra special. Local villagers along the Old Chiang Mai-Lamphun Road are trying to save the century-old yang na trees as they are becoming more and more unhealthy from lack of air and nutrition. 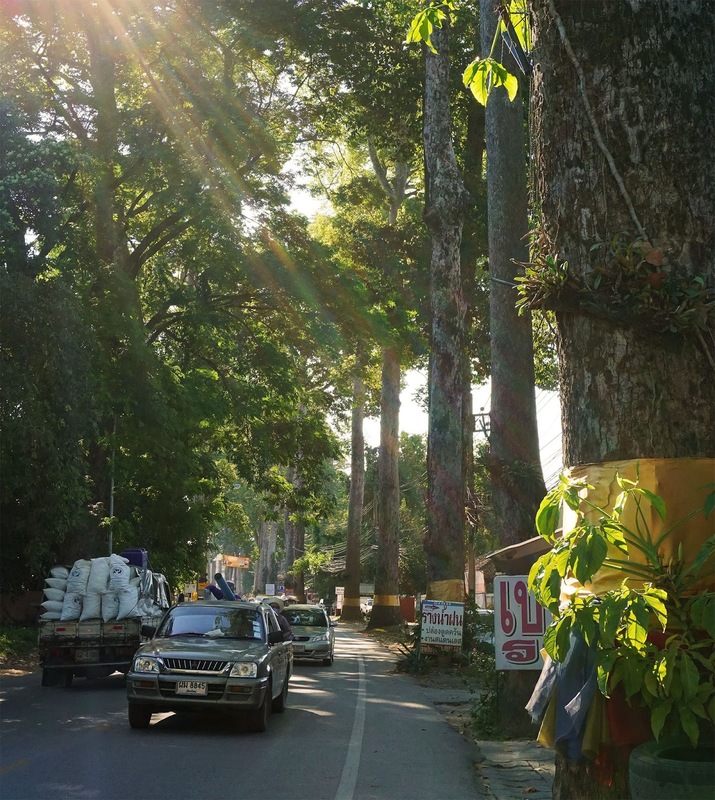 According to Bunchong Somboonchai, head of a tree doctor volunteer group, said that there are about 900 yang na trees along the road and about 340 of them are in critical condition, being strangled by the concrete road, smothered by fumes of heavy traffic and generally living in a bad environment. On August 30th, locals from A. Saraphi and volunteers gathered at Wat Koo Sua to implement a method invented by Maejo University, with support from Chiang Mai Provincial Office of Natural Resources and Environment. They delivered food and air through perforated PVC pipes filled with fertiliser were used and buried about two metres from the tree’s roots. Bunchong added that it would take about two years for each tree to recover and to sustainably preserve these historic trees the whole community has to be involved and learn more about how to care for them. I was reading the OSM blog today, Christmas Day, and it contained a note concerning node #1, that is, the OSM object with an id of 1. It turns out that this particular node happens to mark a tree, and in addition that tree happens to grow in Passau, Germany, a town I visited a couple of years ago. It was my debarkation point for a 6-day bicycle trip along the Danube. How's that for coincidence? 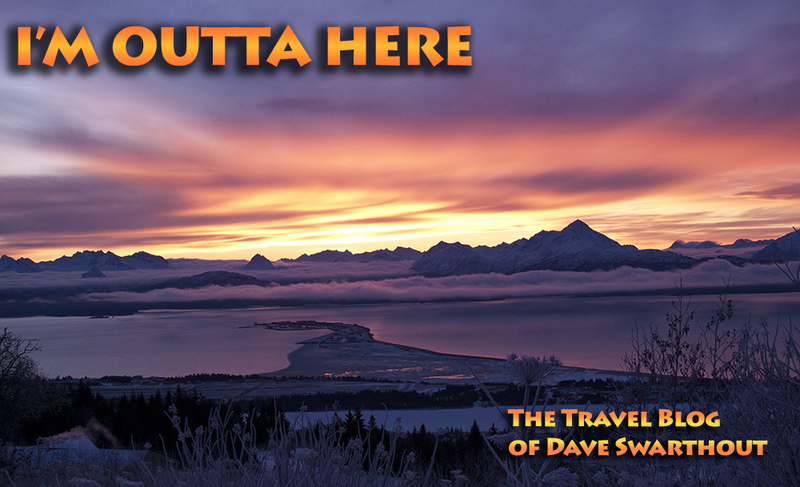 Very interesting, Dave! Are your changes uniquely saved on your personal GPS, or can you 'export' them for others to use? Nathan, all my data is in the OSM database and is available for anybody to use. The OSM map you see on the Open Street Map homepage does not, for practical reasons, show trees as I've rendered them. It shows them as a tiny green circle. Theoretically, any object at all can be tagged and stored in that database. Many are not shown in as great detail as my maps because the display would be too clogged with icons to be useful. But for me, trees are important, so I choose to render them on my personal maps. Recall my statement about towers, communication towers, for example? These are not shown on that map at all. The reason is that in certain areas where OSM is popular, in Europe especially, almost all existing communication towers have been located and tagged. Displaying (rendering) all those towers would totally block more important things like highways and fuel stations therefore the online OSM maps don't show them at all. Many people don't want to see trees but are interested only in using their GPS for navigation from place to place. Here in Thailand, or in Alaska, where mapped radio towers and OSM mappers are scarce, I can show them without that drawback. The beautiful thing about OSM is that map designers and other data consumers can use the data in any way they like, for free. No strings attached, in stark contrast to Google of Bing maps. People who want to make bicycle specific maps can do that while folks interested in landcover like forests, trees, shrubs, farms and orchards, can choose to render those objects that are meaningful to them. OSM is really a database, not a map. How one uses the data and what they intend to show is their decision. I intend to write a followup piece on OSM and map creation and even if you never take the plunge into making your own maps, it will answer these sorts of questions better. I also want to address the question of exporting data. Yes, you can export any or all OSM data but it's raw data, not directly usable as a map. In practice, after an editing session I download the data for my local area, northern Thailand, and then using a combination of customized configuration files and a special program called mkgmap (stands for make Garmin map) combine or compile everything into the map I use in my GPS. Making maps is not for the faint hearted however. If you're truly interested and computer literate it can certainly be done.